According to Project Time Off, Americans may be finally rounding the bend on vacation culture – meaning more folks are actually using their vacation time. This is, of course, great news for the travel industry. In particular: cruise lines. With yearly revenue estimates of nearly $40 billion, cruises are a sizable vertical with even bigger growth potential; especially when you consider that a quarter of Americans have ever gone on one. If you’re looking to capture more of the vacation crowd with your cruise line or ship, it’s important to understand how people decide which cruises to book. According to data from Google, folks are basing their decisions less and less on brand name, and more on ports and destinations. That’s a win for small and mid-size cruise lines, as customers appear to be more concerned with where they’re going, and less so with who is taking them there. This shift in consumer behavior can be a huge benefit, but it requires brands to do more digital legwork to ensure their packages are visible to potential vacationers. Below, we discuss our five best marketing tips for growing your customer base – both new and repeat cruisers – through an array of digital strategies, millennial-focused voyages, and loyalty programs. Expanding customer reach in the digital sphere is essential. You likely have one or more personnel managing every aspect of the customer acquisition funnel – from social media to email marketing, analytics, and content strategies. But true power comes from getting these separate channels to communicate with each other. With the implementation of a universal data hub, your cruise line can gain the ability to collect and aggregate data from all systems into a single database technology. This will enable enhanced visibility and analysis across multiple systems and accurate marketing attribution – including offline channels! That’s invaluable when considering all the data collected from POS on the cruise ship itself. This newfound digital maturity will also allow previously disparate systems to access data that originated on other systems. A universal data hub goes beyond commonplace strategies and takes your data maturity to a deeper level and empower stronger, smarter marketing efforts. Think about the benefits of consolidating campaign interactions across all channels at the user level! 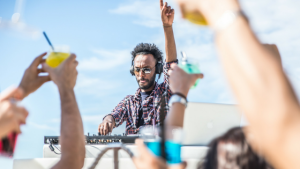 For example, Carnival Cruise Lines Chief Digital Officer Kathy Mayor spent the past two years hosting their “Choose Fun” campaign, which relies heavily on… you guessed it, digital marketing. We’re talkin’ paid social, display ads, customer testimonials, video on streaming platforms, and traditional TV ads. Combining the impact of each of those pieces alone would be an analytics nightmare. With a data hub in place, this can serve as the source of truth for all reporting, dashboards, and business intelligence related to Choose Fun and other campaigns. This will further empower marketing efforts by elevating beyond broad segmentation, and into dynamic 1-to-1 personalization. According to VWO, travel eCommerce is one of the trickiest online businesses there is, with a whopping 95% of inbound traffic bouncing before completing a purchase. Of course, you can’t expect every visitor to convert – but trends across the industry are disappointing at best. With mobile searchers quick to exit websites due to poor user experience, slow load times, and annoying pop-up ads, employing a strategy for quicker and smoother online processes will put you a cut above the rest. Additionally, make sure your cruise-goers have easy access to customer service, regardless of where they are in the funnel. Think of this as your last-ditch effort to save the sale (or potentially a life-long customer). Offering a number for them to call is a no-brainer, but there should be quicker, more flexible options, too. Think: instant chat, email, the option for customer call-back, and even social media support. The average cruiser is 46-years-old, down a whopping 20 years from 66-years-old in 2002. If trends continue this way, it’d be foolish not to inch towards the millennial cohort – especially as research shows millennials are poised to outnumber Baby Boomers as early as 2019. Put simply, millennials are aging, there’s a lot of them, and their spending power is only going to increase over the coming years. This, in line with the positive shift of vacation culture (hello, unlimited vacation day packages), means the opportunity is ripe to seize this potential customer base. How? For one, make social media marketing a priority. But beyond that, think about creating millennial-friendly cruise packages. Carnival, for example, offers short, inexpensive trips to capture twenty-somethings. Think of it as a way for young folks to taste-test cruising. Other cruise lines are offering experiences that cater to a younger crowd, like sky bikes or musical festivals at sea. It’s harder to capture a first-time customer than repeat business. So, for those customers who’ve set sail on your cruise line already, make sure you offer more than just email newsletters to keep them engaged. Maintain interest past the dock with a can’t-be-missed loyalty program. As Kathy Moyer at Carnival posits, don’t make customers wait to reap the benefits of their sustained loyalty. Rather than requiring three or more trips to begin to experience loyalty rewards, make them available to customers right away. That may be offering a perk the moment they sign up or the second time they book a cruise with you. Free things, no matter the face value, can be incredibly influential in customer decision-making. Examples of rewards can be simple – such as free bottles of water and a welcoming cocktail to enjoy on the ship. 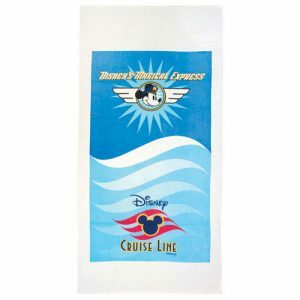 Memory-inducing giveaways are also a great idea, like commemorative pins and customized, branded beach towels to take home. These types of rewards will be year-round reminders to customers of all the fun they had on the cruise – and encourage them to book another. As rewards increase for more seasoned sailors, the program might offer things like complimentary spa services and private cocktail parties – perks that make customers feel like they’re really getting the special treatment and rewarded for their loyalty. There’s no marketing strategy so effective as a reliable word-of-mouth referral. Authentic testimonies can help nudge cruise-goers to book their next trip, but referrals are even more valuable for new customers who have never sailed before. The magic of this strategy is that it’s a win-win-win for the experienced vacationer, the new customer, and, of course, the cruise line. How does it work for bigger brands? A referral program gains rewards for repeat customers, usually in the way of reduced cost to book their own cruise: $100, $200, and even $400 off their own booking on some lines. In turn, new customers often receive a discount of their own for booking. 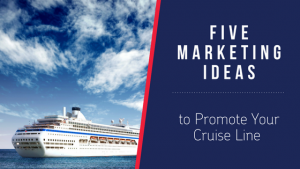 And as for the cruise line, so long as they market the referral program well-enough (and include enticing rewards), customers will do a lot of the heavy lifting in spreading the word. The landscape of the cruise industry is quickly changing as younger crowds venture onboard. Cruise liners can keep and expand this momentum by following suit with customer-centric strategies that utilize the same technology-focus their customers use and expect from other businesses – fantastic website design and UX, social media, and incentives for loyalty. Call us, the Promo Know-How People to work together to find the right idea to promote your cruise line.